Growing up in Michigan, I listened to The Verve Pipe long before “The Freshman” was remixed by the record labels and jammed down our throats. After “I’ve Suffered a Head Injury” came “Pop Smear.” Touring with rock legends like Kiss and an appearance by lead singer Brian Vander Ark in the movie “Rock Star” (as a guitar player, not a singer) made it seem like TVP was well on its way to super stardom. However, the music industry churns and churns, and great acts like TVP get chewed up and spit out on a regular basis. In this world of over-produced music, ridiculously elaborate acts and behemoth record companies trying to maintain their stranglehold on a creative and amazing art, it’s refreshing to see artists like Vander Ark and The Verve Pipe doing something different. Without even realizing it perhaps, artists like this are using principles of inbound marketing to take the power back and reach their audience. Buyer Personas: the boys in the band are now dads. They know the people who grew up listening to their music are also likely wrangling kids and cleaning up messes just like them. They know their buyer personas, and they’re speaking to them with content like The Family Album. Using his knowledge of his fans, Vander Ark started holding concerts where few artists ever venture: his fan’s homes. With “Lawn Chairs and Living Rooms” Vander Ark takes his music directly to his fans in their homes, where they invite friends over to enjoy an intimate show. Vander Ark knows his buyer personas, and knows that they enjoy this interaction. Content Marketing: The Brian Vander Ark Soundcloud account offers fans songs for free, as well as interviews and behind the scenes content that allows fans to dive deeper into their relationship with the band. At his “Lawn Chairs and Living Rooms” concerts, Vander Ark encourages his fans to record the show – audio or video – and share it with their friends. It’s a great recipe for viral content. The Verve Pipe has a Facebook page of course, where they share news about the band, the latest album and tour information. But they also do cool things like asking fans to share photos over the years. It’s a social place for fans and the band to connect. Final Thoughts: This shift from relying on a record company to do everything to the artist having the power and responsibility of promoting themselves is the beginning of a revolution. From intimate concerts to viral content to Kickstarter campaigns funding a new record, it’s an exciting new world. What do you say? 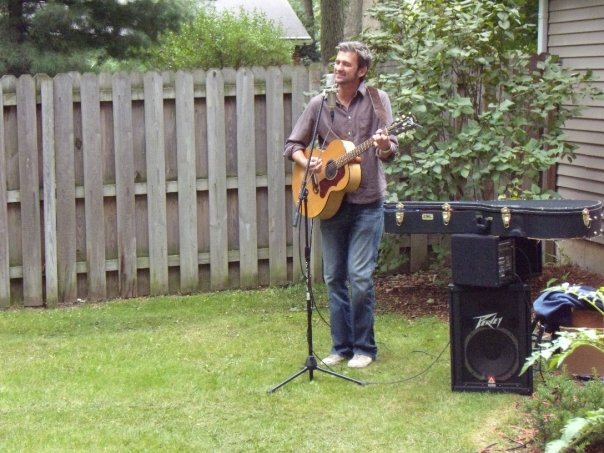 Would you host a concert in your yard or house, of an artist you love? Comment below with your thoughts! This entry was posted in inbound marketing, inbound marketing for music and tagged brian vander ark, inbound marketing, marketing for music on August 27, 2013 by danmoyle.